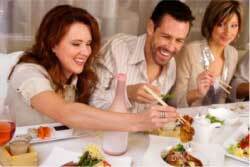 Top 6 Tips for Frugal Foodies ~ Save Some Serious Dough When Dining Out! Enough with the home-cooked meals. It's time to get out of the house and let someone else prepare your food for a change. In response to tight budgets, frugal advisers have recommended for some time now that we stay at home to save money. But such deprivation grows old fast, so maybe it's time to consider these six tips to help you spread your dining wings without crash landing your budget. Members check-in to various locations on their mobile phones using this service, but did you know you can also receive offers for freebies and discounts simply by letting FourSquare know where you are? Check out a recent segment on FOX & Friends for a "how to" on using the app for restaurant savings. Restaurants are one of the most common frequenters of daily deal offerings, so it pays to keep an eye out for vouchers that can greatly reduce the cost of dining at a new or favored eatery. Just make sure you read the small print and are aware of expiration dates and exclusions. For example, most restaurant vouchers don't include drinks. Eating early isn't just for our elders. Happy hour ad early bird deals have become more common as restaurants try to fill in slow-traffic times. For example, Applebee's Neighborhood Grill offers full-size appetizers for under $5 before 6 p.m., plus $3 drink specials. American restaurants usually overload our plates -- unless they're into nuvo cuisine -- so there's often enough food for two in a single order. You can cut your costs down to around $20 by simply sharing an appetizer, entree and dessert with a friend or date. We tend to think of gift cards in terms of what we can offer others, but they're actually very useful for individual purchases. Sites like GiftCardGranny.com let you purchase gift cards for several restaurants at a discounted rate, yielding immediate savings of up to 50 percent. If you live in one of nine major cities, you might download the free MatchPin app. Membership brings you offers, rewards, contests and announcements from a variety of local restaurants. 2 Responses to Top 6 Tips for Frugal Foodies ~ Save Some Serious Dough When Dining Out! I like the idea of splitting up the meal, especially if the serving is big and sharing it with someone. Saves money and unnecessary calories. Top 13 Halloween Costumes for Baby Boomers ~ Ideas for Men, Women and Couples!